Sizes starting at 3.5"x2" to 33.75"x11"
School flyer printing is something every school administrator or college organization should think about. Whether they’re used for promoting a school or used as handouts for educating students on an important topic, school flyers let you leverage the power of print and drive your point home. Create your school flyer designs at PrintPlace. Whether you need to bump up enrollment or give students new policy guidelines that will stick with them better than any email, we can make it possible. We have flyer sizes as small as 3.5" x 2" and as massive as 33.75" x 11". We also have a wide selection of folds, stocks, and coatings, ready to fit whatever your school needs. Need thousands of school flyers for mailing promotions or just a few for sharing a new policy? Small and large quantities are covered -- you can print a minimum of 25 flyers up to 250,000 in one order. Your school flyers can be ready for shipping on the same day. For additional help with custom flyers, call our print experts or fill out our custom order form. 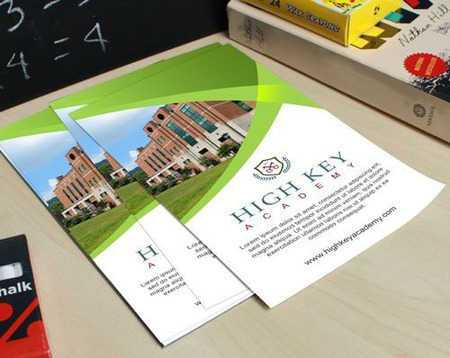 Our school flyer layout templates will help your designs meet printing requirements. They include guidelines so your artwork will be printed accurately. Our school flyers are available flat and in different fold configurations—accordion, double gate, double parallel, gate, half, roll, letter fold/trifold, Z, and french folding. Flat/unfolded flyers - Use these as simple inserts in your school’s direct mail or as handouts to students. This format can easily be slid under doors, stuck on windshields, or used as a mini poster on school bulletin boards. Half-fold / Single fold flyers - This simple fold divides your flyer into two panels. It’s a staple of college flyer printing and is perfect for short lists. Trifold / Letter fold flyers- This classic fold creates three panels on your flyers. This can be useful for laying out simple sequential steps, or for frequently asked questions. This can be handy for materials meant to promote your school. Accordion fold flyers - Accordion fold flyers have four alternating panels. This can be handy for creating an intuitive presentation. Opening an accordion-fold flyer quickly reveals the entire sheet. This makes them particularly-suited for campus maps. Gate fold flyers - This divides your school flyers into three panels. The two outer panels form doors that cover a bigger panel in the middle. This fold can be handy for highlighting one central idea or image, such as your school’s most iconic building. Gate folds can be good for both direct mail and presentations for alumni and parents of prospective students. Double gate fold flyers - This is similar to the gate fold, but there now are four equally-sized panels each covering one of two central panels that fold right in the middle of the flyer. Like the regular gate fold, the double gate fold is quite dramatic and well-suited for presenting pitches to potential donors and parents of prospective students. French fold flyers - The French fold divides your flyer horizontally and then vertically into four equally-sized quadrants. They work well for mini posters with one central design occupying all the panels, school event flyers, or for presentations that need to highlight four major concepts. This format can be useful for sharing your school’s mission and vision statement. Roll fold flyers - The roll fold folds your school flyers inwards, almost like a roll. Since you need to unfold the flyer in sequence to reveal the next panel, this fold creates a user interface perfect for sequential presentations or for long instructions. This flyer fold also works for welcome kits at the start of the school year, and other situations where you’d need students to take in information sequentially. These aren’t the only way to use your school flyers though. Let your school spirit run wild. Call our friendly print experts with any questions about flyer printing for schools.